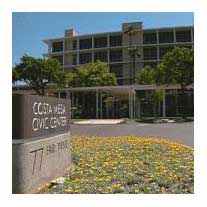 Rather than just leap in and attempt to post comments regarding the Costa Mesa City Council Study Session on Tuesday, February 10th, based on the Daily Pilot story by Alan Blank or the infernal rant published on the CM Press, I decided to hold off and watch the taped replay of the event last night. I also taped it and re-visited some segments to be sure I understood the participants clearly. That tape replay will replay 9 more times between today and March 1st. You can find that replay schedule HERE. There were three items of interest to all Costa Mesans and, rather than quote issues verbatim and in lengthy detail, I'll let you visit the tape replays or the streaming video of the meeting, which is up and running now so you can form your own opinions. The first item on the agenda dealt with the current cooperative effort between the city and the Costa Mesa Sanitary District dealing with sewer laterals - that part of the sewer that runs from your house to the main line out in the street - being clogged and/or damaged by tree roots. Each of us is responsible for that stretch of pipe, even though it crosses under city-owned property, including sidewalks in most neighborhoods. We have to fix problems with it out to the point where it connects with the Sanitary District's pipe in the street. The city and sanitary district are working closely to find a way to assist homeowners with the costs and procedures involving tree removal and/or repair of the laterals. That's a good sign and is certainly being facilitated by Gary Monahan, who is currently double-dipping as both a councilman and member of the Sanitary District board. The second item was the mid-year budget review which, as you might expect, resulted in some very interesting disclosures. Most of those were covered in Blank's Daily Pilot piece, HERE. If you want to read the CM Press rant you're on your own. Major sources of municipal income - Sales Taxes, Property Taxes and Transient Occupancy Taxes (TOT) all will be down this year. We know the TOT is down around 10% this fiscal year, but the last two months are down 14% and 18% - a very sad, unhealthy trend for our friends in the hospitality business. Sales Taxes are anticipated to be way down, but no reliable numbers are available right now. Marc Puckett, Finance Director, hedged his bets by saying that he'd know more early in March. However, he did say that it looked like a 10% drop would not be unexpected. Property Tax revenues will soon become apparent - assuming the state and county don't do anything stupid - like withholding them. It seemed to me that the general consensus around the table was that balancing the 09/10 budget is going to require a blend of fund balance, new revenue sources and severe belt-tightening. Among the items discussed specifically was increasing the reimbursement the city currently gets for the ABLE (helicopter) program. Many other issues were kicked around but no firm recommendations were made that would result in substantiative savings. One large item involved re-opening discussions with the four employee bargaining units. Under normal circumstances - which these certainly are not - the city would be required to wait for an audited report following the end of the fiscal year in June. That would take a couple months, which would take us to September before discussions could take place between the city and the employee unions. However, City Manager Allan Roeder postulated that there is enough significant data available right now to support approaching the unions to begin discussions. The simple fact is that salaries and benefits make up the bulk of the city budget and that's where it needs to be trimmed. There are only a couple ways to do it - re-open discussions with the unions to scale back their packages or begin laying off employees. I didn't get the impression that anyone in the room Tuesday wanted the latter. Suffice it to say, all hands at the meeting understood that serious and severe changes will have to be made if the city is to remain fiscally sound. I will observe that Mayor Mansoor went on a little preaching snit, reading from what was obviously a prepared text. That's our guy - never let the facts presented to him get in the way of what he already thinks! The city - and all it's residents and employees - face some bleak times ahead. Within the next couple months we'll see just how smart and innovative our elected leaders are in dealing with this crisis - because that's exactly what it is. And, I will remind you of their short-sightedness over the past year when the y1) insisted on perpetuating the RRIP program, which cost the city hundreds of thousands of dollars in fees - more than $1 million over the past couple years and, 2) their unwillingness to put the issue of increasing the TOT on the ballot for the voters to consider. Had that question been posed to the voters and they passed it, we would now be seeing an increase in revenue of approximately $1 million for each increase in percentage point. As mentioned many times before, Costa Mesa has the lowest TOT in the county - it's less than half that of most other cities. The final item on the agenda was the presentation by Steve Beazley, CEO of the Orange County Fair and Exhibition Center, about the proposed use of the current Equestrian Center site for additional parking. Many speaker stood and told the council how valuable the Center is as a community resource - before Beazley arrived, unfortunately. BEAZLEY - "IT DOESN'T PENCIL OUT"
My take on this issue is that it sure looks like Beazley has his mind made up - that the Equestrian Center just doesn't pencil out as a profit center. The Board makes only $65,000 per year net profit from that property, which is a mere pittance when you consider other potential uses. Beazley said that, by using it as a parking lot, the Board would realize over $200,000 per year. So, watch the tape or streaming video of this meeting. It's very important for all of us to pay attention and provide our leaders with our views on this subject. Roeder said that he's told the city staff to come up with cost saving ideas - there are no bad ideas. Well, that applies to the residents of this city, too. Let your leaders know if you think you've got a good idea - we sure do need them now. Thanks for a detailed report. I also would like to encourage everybody who visits your blog to watch and listen the entire study session carefully. I watched it and plan to do it again. Just want to point out something that Mr. Puckett stressed many times during the meeting. Our deficit for the current year is expected to be $11 million, but he believes that it might go up another 5 to 7 million. So, we'll probably use another $18.00 million from our "funds" to balance the budget. Now it is time for our local leaders to engage in economic analysis and economic planning? I know Katrina and Monahan should be able to do it, but I'm skeptical about the other three. One quick note that you might not realize. The reserves, aka fund balance, also earn interest, which has dropped sharply as short term interest rates on safe investments have slid sharply. Less interest on a lower fund balance is one more drop in revenue which every city will need to contend with. Welcome. You must be a lonely person - a "progressive" in OC. :-) Thanks for the comment. Yes, we do realize that the fund balance - not technically "reserves" - resides in one or more interest bearing accounts, which certainly have been slipping just like mine have. If you've watched the study session you realize just how serious this issue is, and how we're a long way from seeing a solution. All indicators point to Fiscal Year 09/10 being worse - much worse - than our current year that ends in June. If we do drill deeper into the fund balance to make it through this fiscal year there will not be much left for the next. Without new revenue sources - most of which would require voter approval - and some serious cost containment efforts on the part of city staff it will simply not be possible to balance the FY 09/10 budget. If the four employee bargaining units, for example, choose not to sit down with city management staff and hammer out some kind of change in their contracts it is virtually guaranteed that layoffs will happen. No one wants that to happen. Thanks, again for participating here. You're welcome anytime.